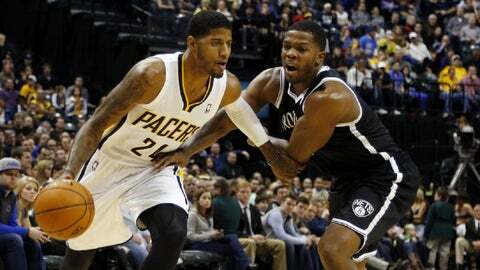 Indiana's Paul George scored 24 points to help the Pacers beat the Nets on Saturday night. INDIANAPOLIS Even though they shot well in the first half, the Indiana Pacers knew that wasn’t what would win them the game. Turning up their defense in the third quarter was what it took to pull away from the Brooklyn Nets. Paul George scored 24 points and Lance Stephenson added 23 to lead the Pacers to a 105-91 victory over on Saturday night. "This team has a unique way of figuring a team out as the game goes on," coach Frank Vogel said. "We only forced four turnovers in the first half, so we did feel they were a little too comfortable on the defensive end." "We felt like we’ve got to be aggressive, and come out with more energy," George said. "We were allowing guys to beat us on 1-on-1 plays. If we are going to get beat, it’s going to have to be by contested shots and the ball being swung." Paul Pierce scored 18 points, Mirza Teletovic 17, Deron Williams 14 and Alan Anderson 10 for the Nets, who fell to 10-20. "They took control of the third quarter with our turnovers, and those turnovers converting into layups," Nets coach Jason Kidd said. "George was knocking down jump shots, 3s. He had a four-point play. "But those guys, we didn’t make them uncomfortable on the perimeter." Indiana, leading by three points at the start of the third quarter, went on an 11-3 run as the Nets turned the ball over on four straight possessions. That pushed the Pacers’ lead to 72-61 with 8:07 to go in the period, and they maintained their edge throughout. "We had to let the game come to us in the third quarter and play aggressive defense," Stephenson said. George hit a 16-foot, pull-up jumper to give the Pacers their biggest lead, 105-89, with 2:15 to play. The Pacers shot 53.5 percent in beating the Nets for the third time this season. They outscored the Nets 14-2 in the paint in the decisive third quarter and 20-6 in the second half. Vogel credited Hill with much of his team’s success, saying, "I thought George Hill was our best player tonight. He played exceptional defense on Deron Williams, and every time we needed a big basket or timely play, he made it." The Nets continue their difficult three-game road trip with games in San Antonio and Oklahoma City. The first half was close throughout, with eight lead changes and five ties. Indiana shot 54 percent before halftime and the Nets made 50 percent. NOTES: With three 3-pointers, George moved past Austin Croshere into seventh place in franchise history and sixth in NBA history with a total of 378 in his career. The Nets have been outscored 86-60 in the third quarter of their three games with the Pacers this season. The Pacers allowed just five offensive rebounds, tying their season low.